(1) During the first exercise, a stationary 1,000-inch "A" rifle target (or some other appropriate target) is used as an aiming point. To aim for range, select the correct segment of the vertical line of the reticle and place it on the center of the visible mass of the target. (2) Find the correct sight picture for each successive 50 meters of range on the reticle. Then progress to sight pictures that require interpolation of range on the reticle; for example, 425 meters, 525 meters. 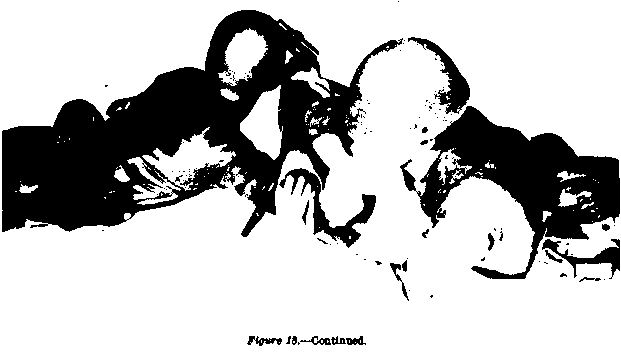 A trained gunner, acting as coach, should check each sight picture when in the prone position. b. Aiming With Leads. (1) The reticle is provided with a horizontal scale, graduated in 5-mil (one lead) units, which furnishes a means of applying leads (para 5). Figure 17. Unlocking and opening the breech. of fire, point the axis of the bore ahead of the target. 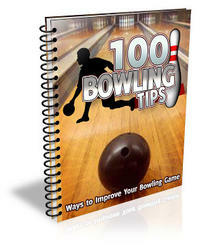 Use leads for firing on moving targets. No leads are used for targets moving directly toward or away from the gun position. Aim at the center of visible mass. (3) Exercises are conducted which require setting announced leads on a subcaliber target (1,000-inch) or some other appropriate aiming point. The target remains stationary, but it is assumed to be at any range from 0 to 600 meters and moving from right or left at speeds requiring variation in the number of leads. c. Aiming for Range With Leads. Range and leads are combined on the sight reticle by a series of segmented horizontal lines. (1) Lead lines extend right and left of the vertical range line. 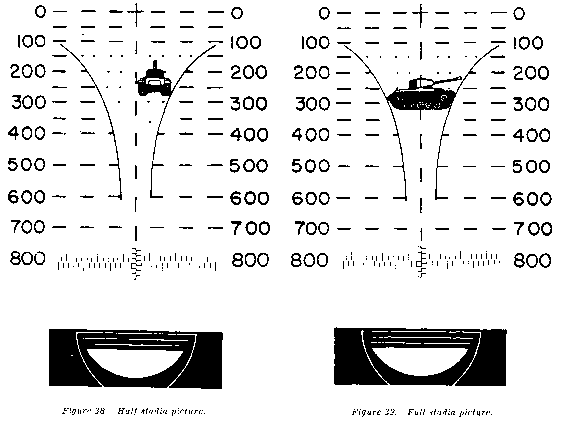 Interpolate ranges between the 50-meter intervals etched on the sight reticle. Select appropriate range (this will be imaginary if it is interpolated) and lead on the reticle and project them to the point of intersection. Place this point on the center of mass of the target. (2) The length of one space or of one line of the horizontal line is equal to one lead. For instance, the point at the end of the first space represents one lead; the point at the end of the second line, four leads (two spaces and two lines). Count off on this line, to the left or right of the vertical range line, the number of leads needed. (3) Lay the rifle on the target at several different ranges and leads. The target remains stationary, but an assumed range, the direction, and the number of leads are specified in each case. The coach checks each sight picture when in the prone position. Range and leads requiring interpolation are included. (4) At least one period of this training is devoted to the use of the illuminated reticle. This accustoms personnel to aiming during periods of limited visibility.